Comedian Shane Mauss has been doing stand-up for over a decade, catching his first break after receiving the Best Stand-Up award at the HBO US Comedy Arts Festival in 2007. “I got into comedy because I didn’t want to get a real job,” Mauss told me as he was driving through the Midwest to his next show. Comedy, however, quickly proved to be more than a full-time gig as he started to find his niche: blending his act with science education. He’s since made appearances on shows such as Jimmy Kimmel Live, Conan, and Comedy Central Presents; maintained the popular podcast Here We Are; and brought his unique act, Stand Up Science, to venues across the country. Mauss, who originally hails from the Midwest—La Crosse, Wisconsin to be exact—will be making a stop in Minneapolis on February 2, 2019, at the Skyway Theatre. His act, which changes from city to city, will feature local scientists Colin DeYoung and Bob Krueger of the University of Minnesota as well as local comic Mike Lester. In the case of this weekend’s show, DeYoung is an associate professor of psychology and focuses his research on personality, individual differences, and behavioral genetics; Krueger is also in the psychology department, holding the title of Distinguished McKnight University Professor and focusing his research on the structure and sources of personality. Lester, a stand-up comic out of Minneapolis, was voted one of CityPages’ artists of the year in 2016 and has received acclaim in the comedy world in numerous ways, including as part of the sketch-comedy group Lestaril. Mauss has developed a kind of network among academics throughout the country, particularly through his work on his podcast, and finds it relatively simple to tap into that network to find guests in different cities and to make each experience a unique one. “I’m a real testament to the idea that anyone can get into science at any age,” he said. “I wasn’t a very good student, but I developed a natural curiosity [towards science] in my early 20s.” After the 2007 HBO festival, Mauss had garnered a respectable stand-up act, but he felt he “wanted to talk about more meaningful things.” This led to his reaching out to local scientists and ultimately to the creation of Here We Are, which has given him the opportunity to have conversations with numerous academics on a wide array of topics—many that would rarely be given much attention in mainstream science reporting. 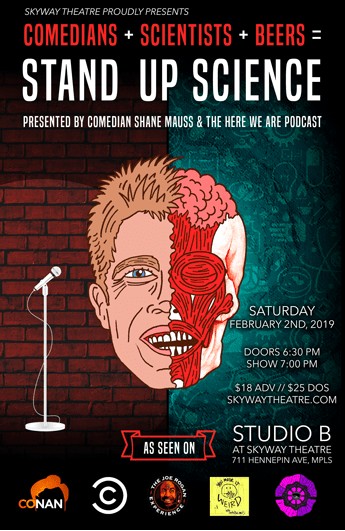 Tickets are available for Stand Up Science at the Skyway Theatre here. If you’d like a taste of what to expect, check out some clips from previous shows on Shane Mauss’s website.